May 16, 2015 Alumni, Events, Faculty & Staff, President, Students Comments are disabled after 182 days. 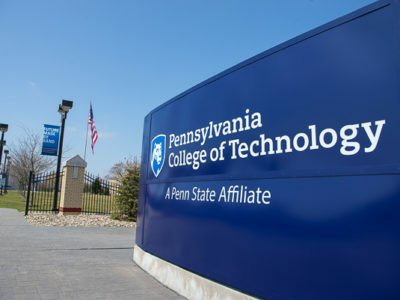 Pennsylvania College of Technology held three commencement ceremonies May 15-16 for more than 900 students who petitioned to graduate following the Spring 2015 semester. The Friday afternoon proceedings at the Community Arts Center honored students from the School of Business & Hospitality and the School of Construction & Design Technologies. The School of Industrial, Computing & Engineering Technologies and the School of Transportation & Natural Resources Technologies were featured Saturday morning, while students from the School of Health Sciences and the School of Sciences, Humanities & Visual Communications graduated during the afternoon session. Student speakers were Matthew J. Glodowski, of Hainesport, New Jersey, awarded a bachelor’s degree in building science and sustainable design: architectural technology concentration on Friday; Andrew S. Manley, of Cogan Station, who earned two bachelor’s degrees – information technology sciences: gaming and simulation, and software development and information management on Saturday morning; and Bethany M. Reppert, of Minersville, who received a bachelor’s degree in applied human services Saturday afternoon. The college also bestowed three Excellence in Teaching Awards and three alumni awards. President Davie Jane Gilmour with her cell phone, inviting others to snap away and use #pctgrad when posting to social media. “After all, we are a college of technology!” she said. Matthew J. Glodowski, who conscientiously led both the Architecture Club and the U.S. Green Building Council Students of Penn College, takes to the magnificent Community Arts Center stage for his Friday address. … prompting a standing ovation from classmates that flowed throughout the venue. Bethany M. Reppert, whose healthy brand of student activism surely left her community better than she found it, followed her script but not her game plan. She said she’d hoped to just do her schoolwork and stay under the radar, but frequent on- and off-campus volunteer opportunities gave her little choice but to get involved. … and, prior to commencement, with Rachel C. Bryant, a baking and pastry arts student from State College. Graduates of the legal assistant-paralegal major stop on their way to the Community Arts Center. The Danish phrase on aviation maintenance technician graduate Kathreen D. Larsen’s cap translates to “Never is not an option.” She chose the phrase because she was told many times that she would “never” be an aviation mechanic. She chose the language based on her lineage. The happiness of 2015 Wildcat “Athlete of the Year,” volleyball player and graphic design grad Courtney L. Gernert, of Palmyra, can’t be constrained. Degree candidates move into their rightful place in the center of attention. … and keeps smiling as he thanks the college community and his biggest supporter (his wife, Nova). The president congratulates faculty honoree John G. Upcraft, instructor of machine tool technology/automated manufacturing, a popular mentor to the SAE Baja team and the first recipient of a bachelor’s degree from Penn College. Collision repair instructor Roy H. Klinger, who has helped take the automotive restoration technology major into national prominence, expresses his gratitude for his Excellence in Teaching award. Understandably all smiles is Brittany L. Delmo, a plastics and polymer engineering technology major from Milford. A reverent and hopeful audience pays heed. Maxwell A. Davert, graduating in building science and sustainable design, waits to be announced by Carolyn R. Strickland, vice president for enrollment management/associate provost. Davert, whose college years were marked by a series of well-received videos shot from a quadcopter, included the DJI logo and slogan on his mortarboard to acknowledge the drone’s manufacturer. As the clock ticks toward Friday’s procession, culinary arts and systems major Briana R. Helmick, of Hershey, makes one last assessment in a Genetti Hotel mirror. A faculty member enjoying the student side of commencement, welding lecturer Matthew W. Nolan smiles to his family. Nolan, who already holds degrees in welding (1987) and occupational therapy assistant (1996), added a bachelor’s in technology management Friday. Friday’s student speaker, is encouraged by John M. Young, a member of the college’s board of directors. The family of Adam T. Engel, of South Williamsport, who graduated in business administration: marketing concentration, gathers in the drizzle for a group photo – only a fraction of the group, in fact, that was on hand for his commencement. How many college graduates does it take to fill a photo frame? Dylan N. Murray, of Jersey Shore, among the first graduates in the four-year-old information technology sciences-gaming and simulation major. The bow tie has it! Adam J. Yoder accepts his Volunteer of the Year award and offers advice to new alumni about staying involved with Penn College. Joseph H. and Barbara A. Reynolds receive the president’s profound congratulations on accepting their alumni Humanitarian/Citizenship Award. Welder, artist and award-winning faculty member and alumnus, Michael K. Patterson includes public speaking in his expansive repertoire. Patterson was surprised with presentation of his certificate in welding from Williamsport Area Community College, which he earned in 1977 but never received. Sheltered from the spring storm are archery standout Kendel F. Baier, of Jersey Shore, with her proud mother, Valerie A., administrative assistant to the president. Baier, who earned a degree in building science and sustainable design: architectural technology concentration, is pursuing a master’s degree at the University of North Carolina-Charlotte. A Wildcat student-athlete – golfer Nicholas J. Krupka, of Allentown – receives his degree in industrial and human factors design. The 3-year-old daughter of Benjamin A. Hess (accompanied off-camera by her mother, Stephanie) is proudly in Dad’s corner on graduation day. Hess, a 2003 Alumnus Achievement Award winner, added a bachelor’s in technology management to his 1995 associate degree in computer aided drafting and design. From left, building construction technology instructors Levon A. Whitmyer and Barney A. Kahn IV celebrate with new grads (and Penn College Construction Association members) Vincent S. Del Monte, of Berlin, New Jersey, and Mark A. Lapszynski, of Kennett Square. A quote from Walt Disney appropriately adorns the cap of Michelle M. Holzmann, a building science and sustainable design: architectural technology concentration student from Saylorsburg. Hard work and persistence pay off for Thomas H. Bressler, a food and hospitality management major from Williamsport. These cowboy boots were made for walkin’ across the Community Arts Center stage. No matter what’s next, she has his back. … and is later congratulated outside by Marc E. Bridgens, school dean. The president shares a favorite quote from Mae West, undeniable wisdom from an unlikely source. Mom, forest technology graduate Karen P. Sangl, and daughter leave the theater together. Nursing graduate Julie H. Carr flashes a smile on her way to the ceremony … and then to work in an intensive care unit. Derek E. Teay, of Northampton, a campus leader among IT students, attains his degree in software development and information management. An early childhood education graduate, set to pour her heart into her work. Bryan T. Robinson, of Gilbertsville, a plastics and polymer engineering technology graduate, reunites outdoors with supporters – including Timothy E. Weston, associate professor and department head. … before being greeted with more friendly signage. Soon-to-be-graduates share laughs with their faculty mentors as participants take their places. Associate degree candidates set a festive tone. As the faculty recess, a beach ball is launched aloft. “Old” friends, fairly recent alumni all, take a selfie before commencement. From left are Adam J. Yoder, Sarah R. Shott and Brian D. Walton. As rain coincides with Friday’s recessional, grads hug their well-wishers under the CAC marquee. Katelyn M.McNaughton, of Malvern, snaps a photo of Kimberly R.Martinez, of Jersey Shore, with Brian D. Walton, assistant dean of business and hospitality. The women earned degrees in business administration: marketing concentration; Martinez was enrolled in Walton’s First Year Experience class in Fall 2012. Friends and family envelop the graduates, physically and emotionally. A diploma is presented to Sarah E. Boyer, a dental hygiene: health policy and administration concentration student from Great Mills, Maryland, who also received the Patricia L. Saxton Excellence in Dental Hygiene Award. The award is presented in recognition of President Gilmour’s mother, who died March 28. Anticipatory smiles are part of the pre-commencement wardrobe. A new breed of superheroes, able to help the sick with a singular skill. A closed-circuit screen helps broadcast the proceedings throughout the spacious theater. Saturday morning’s final graduate, class representative Manley, gets a sincere presidential sendoff. Among Saturday’s graduates in electronics and computer engineering technology is Thomas J. Koren, of Warminster. “Selfie fever” proves contagious on-stage. Crossing the street to escape the crowd and finding a natural canopy to deflect raindrops, a family creates a photo op. A new grad exults in his brief “lei-over” between career preparedness and official entry to the working world. Kimberly A. Venti, of Muncy, who served in the Air Force from 1987-91, is among the 36 graduating veterans honored with rousing applause. A financial aid specialist at the college, Venti earned her four-year degree in technology management. Shayna L. Zerby, a baking and pastry arts graduate from Lock Haven, gauges the personal benefit of her academic accomplishment. Chef Charles R. Niedermyer II, an alumnus and one of the weekend’s teaching honorees, surrenders to a photographer’s request. White-shirted members of the architectural technology faculty – Naim N.Jabbour (left) and Daniel L. Brooks – are surrounded by cheerful and grateful students. A full house – and what a house it is! … including Brianna R. Helmick’s nod to a tool of her trade. One of the college’s newest alums shares his happiness (and his graduation cap) with a friend. A future Wildcat tries college on for size. Graduates bond in front of their marquee mention. Family love surrounds Saturday morning’s speaker – including Dad Stephen A. Manley (to his left), executive chef at Le Jeune Chef Restaurant. Applied human services major and Saturday afternoon speaker, Reppert also received the President’s Award for campus service and leadership. Seeming superheroes keep their date with a diploma. A graduate’s mortarboard testifies to her next chapter. A picture of Penn College pride, as father and son celebrate. Many devices with one purpose: capturing their student favorites as they enter the theater. A heartfelt moment with Sandra L. Karnes, speech communications-composition faculty, and her son, Christopher J. Kent, of Bloomsburg, who graduated in renewable energy technologies. Penn College Police Officer Charles E. O’Brien says farewell to another group of students-turned-friends. Three grads pause for a photo during the Saturday morning procession. Annette M. Counterman, of Milton, is presented with her diploma by her husband, Arthur L., an instructor of electrical technology/occupations. A lineup of smart-phone wielding photographers faces a lineup of new graduates. Proudly sporting the colors of his beloved Sigma Nu fraternity, Christopher M. Scheller freezes time with the president. The Sykesville, Maryland, resident graduated in building science and sustainable design: architectural technology concentration. Fluid moves and a carefree spirit carry Wilmer I. Clase, of Lancaster, across the stage. After receiving his architectural technology degree Friday, he will return in the fall to work toward a bachelor’s in building science and sustainable design: architectural technology concentration. Todd S. Woodling (left), assistant professor of building automation technologies, prepares to lead his former students into the auditorium. The woman under the cap, Meriah B. Port, tested this notion; she hadn’t planned to go to college because it wasn’t her “thing,” but received her associate degree in engineering CAD technology. Colorful shoes complement the flowers, making for a springy statement. Two grads show off their diploma folders. Reppert’s cap telegraphs her resolve to follow through on daunting tasks via Data Assessment Planning. A handsome pair of smiles in front of The Genetti Hotel. There’s always time for another student photo, this time with Matthew A. Bamonte, of Milton, an inaugural graduate in information technology sciences-gaming and simulation. Since her mom wouldn’t allow her to wear her cowboy boots, this problem-solving cowgirl/nursing grad found another way to include them in her academic regalia. Lance R. Roan, a graduate in information technology: information assurance and security concentration, poses for a photo with his proud parents. A beaming group: graduates of Web and interactive media, with faculty member Denise S. Leete. Outshining the Community Arts Center’s future headliners, a couple poses for photos before the marquee. River Valley Transit buses take graduates and their families back and forth between the Arts Center and the main campus. A multigenerational mix marks the special day. A student includes Steven P. Johnson, a member of the college’s board of directors, in the selfie stream. Classmates pause for a final photo before the Saturday afternoon ceremony. The president sends a beach ball back into play during her recessional from the theater. Wearing stoles from Lambda Epsilon Chi, the national paralegal honor society, a pair of grads smiles for the camera. A School of Health Sciences graduate displays a justifiably proud smile during the walk down William Street. Drawing on a Biblical proverb about a worthy woman: strength, dignity and no fear of the future. Happy Saturday morning graduates head to the Community Arts Center. The day’s most coveted object: a college degree, held by fewer than 7 percent of the world’s population.